PHILIPSBURG - 7 Owners of one-man businesses on Sint Maarten will appear in the Court of First Instance of Sint Maarten on 6 and 7 February 2018. It is the ““Emerald-case” regarding evading income and turnover tax. These suspicions are the result of the “Emerald-investigation”, an investigation by the anti-corruption unit (TBO, Team Bestrijding Ondermijning) into fraud and corruption in the port of Sint Maarten. It has been found that the companies that are on trial in (in particular) the years 2012-2016 have been paid for approximately 8 million dollars for activities that would have been carried out for the benefit of the Port. These payments were not reported by the companies to the tax authorities. That is punishable by law. According to calculations by the tax authorities of Sint Maarten, the country has lost more than 6 million (Antillean) guilders in tax revenue. In addition, the investigation showed strong indications that the activities, for which the companies were paid by the port, were never performed at all, but that false invoices were used. The businesses that have been summoned are not being prosecuted for this. But this fraudulent context means that this is not about simple tax evasion. 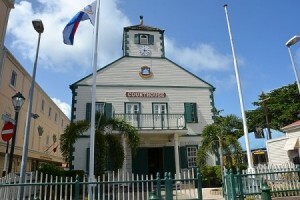 The accused suspects include a member of the Sint Maarten Parliament (MP) and a police officer. A large part of the invoices paid by the port concerned clean and clean-up work. The TBO is, in the aftermath of hurricane Irma, focused on corruption and signs of fraud. As is known, the Dutch government has made 7 million euros available for cleaning work on Sint Maarten after Irma; these funds are distributed through the UNDP. With these criminal cases, the Public Prosecution Service also wants to signal that fraud and corruption cannot be tolerated. The “Emerald-investigation” also investigates the main suspects, M.M., CEO of the Port Authority and O.A., owner of the company that provides security in the port. This case is in the meantime being prepared by the TBO. In that context, witnesses have now been heard by the examining magistrate.